Intended for use in the two-term, freshman-level General, Organic, and Biochemistry course taken by Allied Health students, the Ninth Edition of this widely adopted text includes improved explanations, updated materials, cutting-edge developments, emerging technologies, and revisions to the popular Chemistry in Action sections. 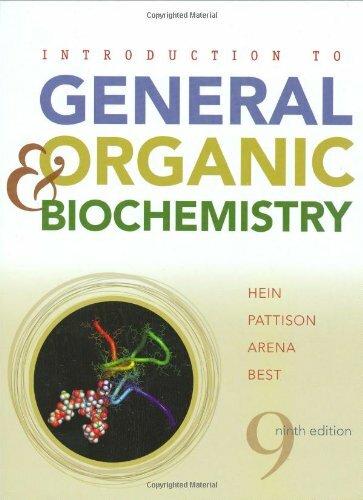 Hein, Pattison, Best, and Arena is a market-proven text that provides the most comprehensive coverage of general, organic, and biochemistry available at this level. Experienced authors, Hein, Pattison, Best, and Arena, recognize that both science and mathematics can be daunting subjects to students. They skillfully anticipate areas of difficulty and pace the text accordingly. Particular emphasis is placed on the understanding of how chemical principles relate to their lives and future careers. The authors focus on problem solving over rote memorization and provide a variety of exercises to aid in the development of this essential skill. While the authors have revised and updated sections on inorganic and organic chemistry throughout the text, they particularly focused on incorporating many of the recent developments in biochemistry. Morris Hein is professor emeritus of chemistry at Mt. San Antonio College, where he regularly taught the preparatory chemistry course and organic chemistry. he is the original author of Foundations of College Chemistry and his name has become synonymous with clarity, meticulous accuracy, and a step-by-step approach that students can follow. Over the years, more than three million students have learned chemistry using a text by Morris Hein. In addition to Foundations of College Chemistry, 12E, he is co-author of Introduction to General Organic and Biochemistry, 9E. He is also the co-author of Foundations of Chemistry in the Laboratory, 12E and Introduction to General, Organic and Biochemistry in the Laboratory, 9E. Scott E. Pattison lives in Muncie, Indiana, where he is a professor of chemistry at Ball State University. he maintains active, current research involving zinc metabolism that provides laboratory experience for both undergraduate and graduate students. A dedicated teacher at the university level for twenty-seven years, his primary area of instruction is biochemistry; however; he greatly enjoys teaching medical/nursing chemistry and general chemistry. Scott became a co-author with Morris Hein on the Third edition of Introduction to General, Organic, and Biochemistry, and he brings his knowledge of students, subject matter, and current research to the text. In addition to his professional career, he volunteers in local schools from preschool through high school, providing extra science experiences for tomorrow's university students. Susan Arena has taught chemistry to students at many levels including middle school, high school, community college and most recently at University of Illinois, Urbana-Champaign. She especially focuses on using active learning techniques to improve the understanding of concepts in chemistry. Susan currently authors chemistry texts and electronic media, and presents workshops for teachers in using active learning and electronic media to teach chemistry. She collaborated with Morris Hen on the seventh edition of Foundations of College Chemistry and became a co-author on the eight and subsequent editions. Leo R. Best taught chemistry for twenty-four years at Mt. San Antonio College. He had been a collaborator and co-author with Morris Hein since the first edition of Introduction to General, Organic, and Biochemistry. he was co-author of Foundations of Chemistry in the Laboratory and Introduction to General, Organic, and Biochemistry in the Laboratory. Hein, Morris; Pattison, Scott; Arena, Susan; Best, Leo R.